Sorry there hasn't been an entry in the past week, but I really wanted my post about Dara to stay up for a while. Fitness - Still going strong in the squat challenge. Some days I think I'm the only one left, but I'm going to keep at it. I did skip one day a week or so ago, but picked it right back up the next day. I'm still waiting on the estimate for the treadmill's repairs. I think I'll call them tomorrow to see what's up. Zachary will be turning 14 next month, and that means he'll be allowed into the weight room at the gym. I think I'm going to buy him a couple of sessions with a personal trainer for his birthday so that he and I can start going together (we'll go during Leisure Swim times so Skye can go swimming). 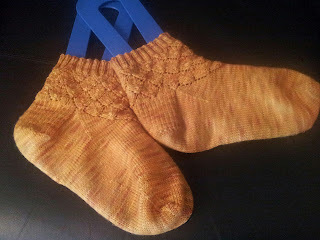 Knit on 2.25mm needles out of Blue Moon Medium-weight Socks That Rock in Ochroid. Food - Nothing to report, but I'm a bit excited. I bought a duck. Not a live one, but a frozen WHOLE DUCK. I've never cooked one before, so I'm really looking forward to this. Jeff still has a 'cook from frozen' turkey that he wants me to cook for him, so that will likely be this weekend. I'm giving some serious thought to South Beach again... I need something to keep myself on track, because relying on my willpower is failing miserably. School - Weirdly enough, last week in Judaism class, I ran into someone I hadn't seen in about 18 years! She was a highschool friend of one of my ex-fiancé's university friends (I got to keep the friend in the breakup) and we never spent much time together, but it was kind of neat to meet up with her again, and it turns out that her family is VERY active in the temple. I'm making supposedly great strides in Hebrew, but I still feel like I'm floundering. I want to get moving on the flash card idea. I want to make a set with the letter names, and a set without so I can memorize them without having to refer back to the chart. My uni class is ... confusing. It feels like we've spent all three weeks so far on making the most simple concept ridiculously complicated and needlessly vague. We'll see what happens. Have you done the Debbie Friedman alef bet song? I found that helped me a lot. It got stuck in my head for ages, but by God I know my alef bet.